The PD-Trak Portfolio Analyzer is an Excel download that generates a number of graphical reports for tracking and portfolio analysis. This file can be saved and retained by the user as a snapshot of the portfolio at the time of download. Alternatively, the reports can be refreshed with the latest project data without the need to re-download the file. The Portfolio Pie Charts report the mix of projects in the proposed project portfolio against various parameters as shown in the examples below. The can be used to determine if the current project portfolio achieves the strategic allocation objectives established by Management. This report contains two pie charts each of which can be set up with default charting parameters chosen by your management team as a meaningful view of your project portfolio. These parameters can be changed by any user as part of their working session. 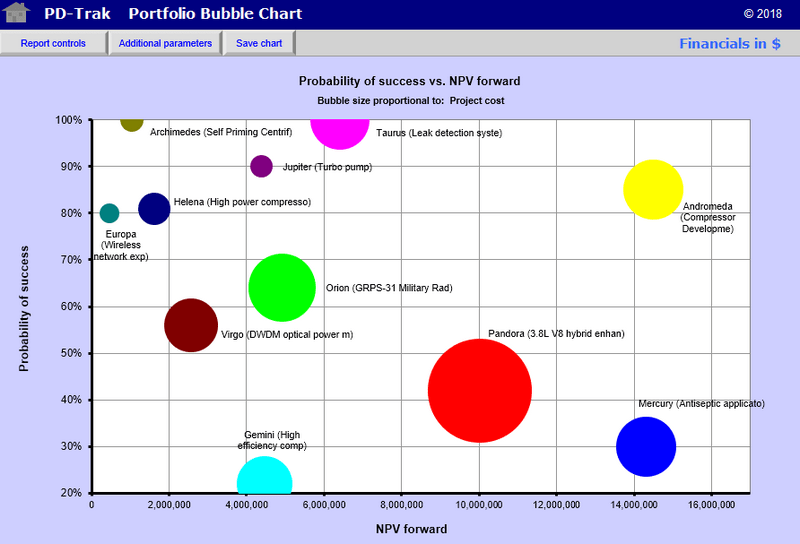 The Portfolio Bubble Chart allows the organization to look at the balance of projects against two or three project parameters. Projects are plotted in bubble format based on parameters that are selected for the x-axis, y-axis and bubble size. One of the most common charts is to assess the balance of risk (shown on the example as the probability of success on the x axis) versus reward (shown in the example as net present value or NPV on the y axis). In this case the top left quadrant represents low risk, low financial return which is representative of typical product enhancement projects. The bottom right represents high risk, high return projects which is representative of typical next generation product development projects that incorporate new technology. The bottom left quadrant is high risk, low reward projects (which should be killed) and the top right represents low risk, high reward projects (clear winners). 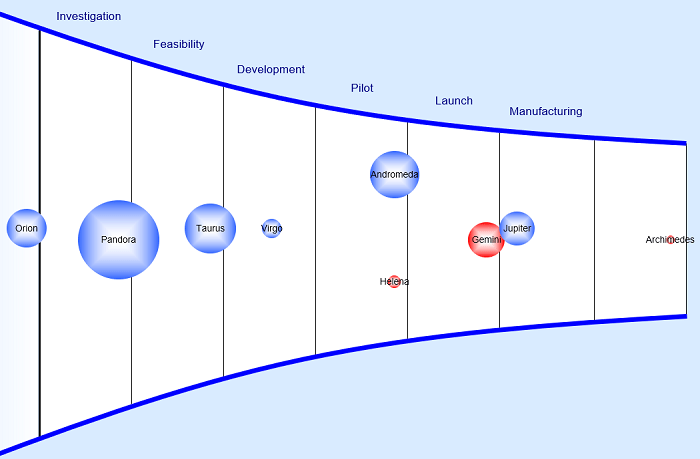 The funnel chart is a popular graphical representation of the projects currently in the pipeline, or waiting to enter the pipeline. Each vertical column represents a phase of the stage-gate process. The size of the bubble can be tied to a number of different metrics e.g. NPV. Red indicates that the project is overdue for a gate review and, based on it’s timing profile, should already be in the next phase.